The data projector purchased with the generous subsidy from Ku-ring-gai Council became available and Northside became one of the first photography clubs to embrace the digital age. “A taste of Asia” was the theme of our first social meeting. Also in February, Alan Davies, the curator of photography of the State Library of New South Wales was our host at an exhibition of “David Moore: 100 photographs”. He was very entertaining as well as insightful. The first digital competition was held in March. Slide shows were now a thing of the past. The first Audio-Visuals were presented by Peter Finlay and Carol Makeham. In May Dawn Zandstra presented “The Evolution of Creativity”. We admired a fantastic display of prints and beautifully crafted Audio Visuals. Hamish Ta-me showed us what life of a fashion photographer and the models were like. Webmaster Chris Barlow added a Forum to our website. Peter and Mary Sambell organized for us to spend a day photographing the rehearsal and concert given by the Willoughby City Brass Band in the Chatswood Bailey Hall. We are given free rein during the rehearsal even to climb on stage and between the players. That hall with stunning woodwork and stain glass windows no longer exists. The weekend in Bundanoon is a memorable one. It began in gorgeous weather and concluded with a frightening storm with trees strewn across the roads and electric wires dangling loosely from their shaky poles. We feared the worst for James Proctor who was traveling on motor bike but he was OK. Susan was not so lucky: first she has a puncture then the gale propelled a heavy object on her windscreen, shattering it badly. Carol & Sam Makeham didn’t want to travel anymore and decided to spend one more night in Bundanoon. Not the best decision, it turns out as the hotel suffered a lengthy black out with no light, no heating, no dinner and a cold shower! The acoustics in St David’s Hall were not good and John Spence generously sponsored the purchase of a wireless microphone to be used by judges and presenters. After months of research and discussions Carolyn Pettigrew presented our new constitution to the AGM and it was unanimously accepted. The National Freestyle Competition became the National Creative Competition. In April Anthony Browell demonstrated what can be achieved with a Pin Hole camera. Several members become addicted to this moody and unpredictable technique. We also spent a long weekend in Sofala and Hill End but received more rain than sunshine. The trees lose their glorious autumn tints; the streets were covered with leaves of all colours and the puddles create magnificent reflections. 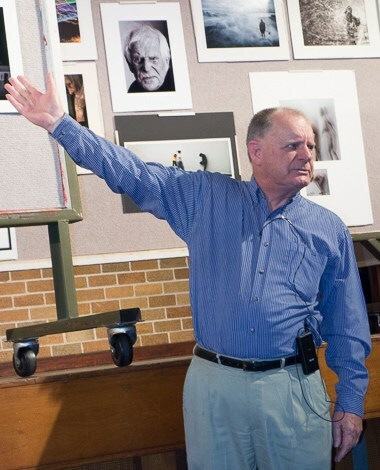 Jacques Roussel’s presentation “Oranges and Lemons” provided an overview of his past fifteen years of photography and Carolyn Pettigrew assisted with guidance and promotion. Mark and Jenny Evans presented 4 Eyes 4 Photojournalist. They were leading horse racing photographers, one for the Telegraph, the other for the Herald. They were most entertaining teasing each other nonstop and their photography superb. And of course the highlight of the year is the development of “Portfolio 07”, a very successful endeavour that produced beautiful results and unearthed many hidden talents. Des Crawley was a great inspiration; he guided each participant to find where to direct their effort and to discover what was the essence of the images. Susan was again a very generous hostess offering her house for every meeting of this six months project. Every portfolio was judged and commented individually by three professional judges. Each participant feels to have grown immensely in photography. It culminated with a great Gala Evening where all the folios were displayed. Jan presented her images and Audio-Visuals titled “Left and Right”. Her images were very artistic and much admired. The AV on the Gordon bats especially appeals. As Jan said: “Photography should be fun and it is”. This year Jan also won the Anzang Nature Competition – Interpretive section. Susan again brought us very exciting presenters. Montalbetti & Campbell demonstrated how they produced their ads. Their technique was painstaking, elaborate and laborious but the results were unique and reminded us of the painting of old masters. Craig Golding followed on the presentation by Tim Clayton a few years ago and showed how for so many years, they made the sports pages of the Sydney Morning Herald so exciting. The residence for the weekend was Parma farm. Our first dinner was in the Butter Factory in Nowra. It was delicious and well presented. In the darkness outside we could smell that we were in the country but could not see that the fields around the restaurant were home for one thousand healthy milking cows. Early drives to the Coast to photograph the sunrises were followed by a delicious breakfast of “Tunnel mushrooms”, chocolate cake and delicious coffee. Susan organized a BBQ for the second dinner, Sam Makeham cooks the steak and sausages whilst Jenny Johnson assembled delicious salads. Chris produced a great AV with each traveler supplying ten images. The annual dinner at the Gordon Golf Club was not to be easily forgotten. Before 6 pm a severe electrical storm hit the Gordon area, dropping hailstones and an inch of rain, causing a complete blackout. Trying to cross main roads was hazardous (even in a car). It lasted for two hours. Fortunately the restaurant had emergency lighting and cooking with gas. Candles added atmosphere and we were disappointed when the light returned two hours later. Perhaps the best ever attended club outing was in June to Cockatoo Island and the Biennale. It offered an interesting mixture of old and new, zany creations and rusty old cranes. In August we took a guided tour of West Head, were given a geology talk and shown Aboriginal carvings and painting. We descended a rocky path down to America Bay but the sunset we were dreaming of didn’t oblige and we climbed up by torch light. The weekend in Bundeena with George Hofsteters was titled “Making the invisible visible”. It was a great location for close ups and nature photography. The views of the coast line were stunning and the rock formations most attractive. The highlight of the weekend was the candle lit story telling by George. Northside Creative Photography organized its second portfolio; Susan again offered her house for the progressive meetings; Des Crawley again guided us to where our efforts should be exerted. The discussions were very lively and we all participated in sharing our opinions. In the end Des feels that we have made so much progress that we should manage successfully without his supervision. Several clubs follow our lead. Steve Mullarkey lead a hands-on seminar on the use the PTE system and showed how to make more exciting Audio-visuals. Carolyn Pettigrew organized an AV competition made out of a set of 34 images. John Huggett set the Photo-Rally in China Town and we learned to cope with disposable cameras. Mark Tedeschi displayed his photography with many great photos of his Law Fraternity. Hamish Ta-Me revisited us. His versatility and imagination were incredible. Not only was he a great fashion photographer, he was also a great street photographer with great love for shadows. He succeeded in having Nikon alter his camera to enable him to photograph the rapid movements of one person that appeared on screen like a big crowd! Never have so many wildflowers been sighted in the Muogamarra nature Reserve. Don Gould was a great leader very much at ease in this very rocky terrain! Seventeen members joined the Port Stephen long weekend outing. An entertaining portrait photography exercise was organized. The dune bus loses its power so it is walking in the dark back to the car park! A torch would have been handy! John leads the outing to the Featherdale Wildlife Park outing and Don showed he is not afraid of snakes! 2010 was again full of highlights, not least was the presentation and hands on demonstration by Brent Pearson on “Painting with lights”. He showed images taken at night on rocky outcrops, using long shutter speeds and lit with flash or torches. He used the same technique in the hall photographing a model, waving brightly coloured “glow sticks” around and behind her. In February we spent a great but a little warm day in Newcastle photographing historic buildings, the people’s beach and Doggy’s beach. Jan organized a guided tour of Christ Church Cathedral. It contains many artifacts of military history and a colourful painting of the legend of St Nicholas. David Oliver presented his new interest: Landscape and documentary photography. He entertained us with anecdotes on the life of a photographer, displayed some of of his magnificent images and promoted “Away” the book he co-authored with Peter Eastway. The annual dinner in Zibibbo was well attended and the food delicious. Two groups spent a week in and around Broken Hill, one as part of the Tri State Safaris Tours and the other one that followed fairly similar itinerary and led by John Chapman and Dawn Zandstra. Some of the highlights were the sunset at the Sculpture Symposium, the Menindee Lakes, the Kinchega National park, the overnight stay at the Mount Gibbs station and the Mutawintji National Park with its carvings and hand paintings. If only the train travel could be reduced by a few hours, tourism in that area would increase exponentially! The weather was perfect and the wild flowers in abundance. We had a friendly encounter with an emu and photographed several types of lizards at close range. Michael Haylen mounted a very successful solo exhibition under the title “Light Sculpture”,”Energy of Form”. In November, Julie Sundberg explained how her “Now + When” program works. She lends photographic equipments to young people who had troubled life. The use of these cameras gives them a sense of power and purpose; one of these young people explained how it gave him the skill and confidence of turning his life around. We were all deeply moved by his account. In February, we explored the Wendy Whitely’s magic garden and Luna Park. Our President Susan organized regular meetings at home to meet the new members. John Huggett set “City Lights” as the theme for the 2011 Photo Rally and many members meet at Custom’s House to be briefed and begin a first night of photography. The entries were judged in April and Jenny Turtle took first place. The 2011 Portfolio was launched and developed through regular meetings with or without the guidance of Sandy Edwards. The progress was enormous for all who participate and on presentation night Prof Des Crawley was full of praise for our achievements and remarked on the number of other clubs who have followed our lead. Dawn Zandstra received an FCC Exceptional Service Award. 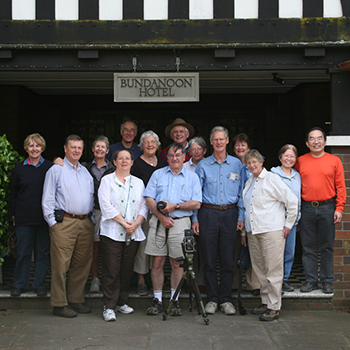 Twenty six members and partners joined in a long weekend in Gloucester. Apart from three flat tyres and a few leeches the weekend was fun, the food delicious and the scenery magnificent. In July Louise Hawson presented her project “52 suburbs”. As she found out when launching her project we were also amazed how much of Sydney we still have to discover. Michael Snedic provided an impressive presentation of his nature photography and lead a very successful workshop at Taronga Zoo. Allan Coker explained what he thought photo-journalism was all about and later judged our competition on the same topic. He preferred a much broader interpretation than the APS one. The Creative Gala Night was also a big success but the attendance was smaller as the participation is now reserved to club members. The outing to Rouse Hill was well attended and members returned with great images. We hear with great regret that our Patron Arch Raymond has passed away. Peter Sambell and John Huggett resigned from the committee after many years of very dedicated and constructive work. Kay Hill rejoins the committee as secretary and Chris Spraggon joins as committee member. And surprise, surprise, Susan Buchanan was re-elected unanimously as President. No one in the history of the club has remained President for nearly as many years as Susan has. Her dedication motivated the whole club. John Chapman organized new permanent lighting for the hall and for this last competition of the year the stage was bathed in bright light. The prints looked their best. John Swainston awarded the Top Shot for monochromes to Brett Handley and whilst he finds the digital section the strongest, he also awarded Brett the top shot of the year. This is an important year for Northside Creative Photography as we celebrated our sixtieth birthday. It also had a sad beginning with the passing away of Mary Raymond, a multi-talented and very charming member of our club, barely a few months after her husband Arch, our club’s Patron, had passed away. As always our first meeting was a social one when we meet our many friends and meet the new members. The theme of the day was “Postcodes”. Brent Pearson presented Environmental Travel Portraiture with memorable images of Namibia. For the February outing we had exclusive access to Bella Vista Farm. Like a real pro and with a gorgeous smile, Susan’s daughter Veronica modelled for us, dressed in period costume. In March Fiona Lumsdaine presented “On Assignment… Making a Heartfelt difference”. Fiona is a volunteer for “Heartfelt” an organization of photographers giving photographic memories to families that have experienced stillbirth and children with terminal illnesses. A truly moving experience; many tears were shed. Thomas Pham passed away; a delightful person with a great story to tell and a great people photographer. The accommodation and restaurant of Canowindra were fully booked for Steve Mullarkey’s exhibition of historical photographs of the township. Most photographs were taken even before the locals had woken up. 100 people attended the opening. In April we visited the Gallipoli Mosque in Auburn. It was followed by delicious coffee and ice cream in the Turkish café Mado. In the afternoon we enjoy the Japanese and Botanic Gardens. In May Northside Creative Photography presented “Dark room to light room” a stunning and very professional display of members images in the Incinerator Art Space. Even professional photographers were impressed. Brett Handley organised the presentation of the digital images where each member’s work can be seen individually at the press of a button. Nearly to the day of the 60th anniversary we dined and wined at the Chatswood Golf Club. How much has our photography matured these last 10 years! In June the outing is to a Northern beach and July to Ball Head Reserve; the light is a challenge but breakfast is delicious. In August our presenter to be was faced with an emergency and unable to come. To the rescue came Steve Mullarkey bursting into song and bringing a tear to the eye. Michael Haylen entertained with an eloquent commentary on the Ball’s Head outing photographs. Alexia Sinclair was our September presenter. Pre-Raphaelite painters have a strong influence on her work and so were the Arthurian legends. She has a masterful control of lighting and composition. The October long week-end away is in and around Kiama; the tourists bring back stunning images. In November Luke Hardy presents “Emotional Baggage”. His work is ethereal with a narrative of Japanese tales. The AGM elects the committee; surprise, surprise: Susan is unanimously re-elected president for her tenth year!! Susan assures us that it is definitely her very last year in that position. Richard Warburton steps down as treasurer and is replaced by James Proctor. This year marks the culmination of an incredible decade with the transition from film to digital photography. The club is led by a very professional and dedicated committee. This year’s main highlight was the Portfolio 2013. Our President Susan was, as always, a great hostess inviting us to her home for the monthly meetings. She also led the discussions and in the footsteps of Professor Des Crawley pinpointed where we should focus our effort. At the end of the cycle Des Crawley gave each participant a very detailed written analysis of their portfolio. The exhibition of the portfolios in November was spectacular and the images highly professional. The Challenge night with Lane Cove and Mosman camera clubs showed us what it feels like to have the photos critiqued but not judged. Perhaps it is the way of the future. We had again great presenters, John Slaytor and Clare Oliver amongst others. 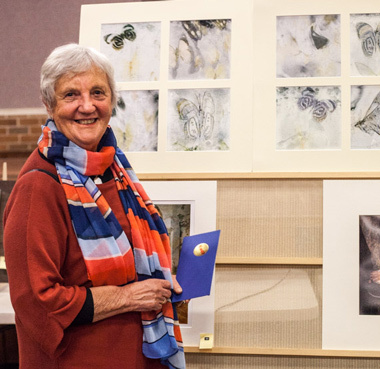 In June, the members of Nebuli Arts, an offshoot of the club, presented a very professional and very successful exhibition of their work at the Lane Cove Art Gallery. A huge crowd attended the official opening; many artworks bore red stickers. In June we suffered the tragic death of Richard Warburton; we miss him very much. (See In Focus July 2013). Steve Mullarkey presented two very detailed and well attended workshops on Lightroom. After many years of looking so well after the bi-monthly catering Joy Williams and Eric Adcock retire. Jennifer Gordon and Prue Platt Hepworth take over. Norman Wong is as always a helping hand. And, it had to happen: After 10 extra-ordinary years Susan stepped down as president. (See In Focus November 2013). A new committee is elected; John Chapman bravely accepts to become President. Mark Kelly was our presenter in March. Mark exhibits regularly at the Milk Factory in Bowral, and he is a versatile photographer who enjoys photographing a variety of subjects. He showed a series of vibrant autumn images, then a collection of colourful abstracts which were macro shots of old rusting cars. Many of these abstract patterns are used on a new range of beautiful silk scarves, which Mark showed us, and even allowed us to touch! He demonstrated some of his post processing techniques, and also encouraged us to have a bit of fun with the Snapseed photo app. In October we had our annual Creative Competition. Dawn Zandstra achieved first while Jan Glover and Prue Platt-Hepworth tied equal first in the popular choice. The photo shows Dawn Zandstra. At the AGM in November Alison Seccombe took over the position of President from John Chapman. The membership debated whether to move to Club Willoughby on a Tuesday night but with considerable opposition the committee decided to wait until a better offer became available. In November we had our friendly Interclub Challenge with Lane Cove and Mosman Camera Clubs. The subject was “e-motion”, purposefully designed to be ambiguous and open to interpretation. Each club showed ten prints and the critiquing was moderated by Susan Buchanan, Jim Crew and Yvonne Lewington. The photo shows Jim Crew from Lane Cove Camera Club. John Chapman organised the last outing of the year. It is incredible how very diverse attractions were available in such a small area: the spectacular Bald Hill lookout, waterfalls, a disused railway tunnel, a Hindu temple and the very colourful rock formations of Coledale. Our first meeting of the year was a social night and members had an opportunity to demonstrate their creativity in interpreting the subject “selfies”. Steve Mullarkey did an excellent job of commenting on the entries, and gave the top award to Peter Steele. As happens every second year this is the year of the portfolio. Susan again generously offered her house for the monthly meetings and also the mentoring. It culminated by a most impressive display of works in November. Shirley Steel was the first presenter of the year and her influence showed in Portfolio 2015. Susan Buchanan and Carolyn Pettigrew introduced us to the delights of Venice in winter. Outings included a day at the races, joining in the Chinese New Year, trips to Kurnell, Mt Annan, North Narrabeen, the fish market and a week-end in Mittagong. NCP provided an exhibit and information centre at the Chatswood Library during the Vivid Lights festival. It was followed by an exhibition of our work at the Willoughby Council and then to the Ku-ring-gai Council Chambers. Steve Mullarkey and Trevor Nash presented a very illuminating workshop on flash. Andrew Chittenden presented a very successful workshop on Lightroom. NCP also made a presentation at the North Sydney Camera Club. The use of alternative processes and creativity left their members spellbound. Instructions for the NCP Creative Competition were to “go wild with your imagination” and that was obviously what members did. Congratulations to Prue Platt-Hepworth who scooped the pool, winning first prize for one of her entries and the popular vote for another!! Jan Glover was the winner of the Top Shot with her stunning photograph of trees in the mist. At the AGM Alison accepted to remain president for a second year. We are appreciative of the generous support provided by Jacques Roussel who researched much of this material. © Northside Creative Photography. Last updated 18/01/2016.